I really like this, Michael Bolton's chorus gives this a nice feel of the '80s/'90s and it's not stupid or annoying like some of their stuff. I like the way it jumps back and forth between The Lonely Island and Bolton as though they're singing two completely different songs, which they really are. It's kind of funny. Is it wrong that I would much prefer to hear the Michael Bolton part as the full song? 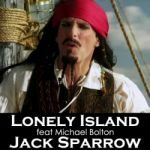 I.......I.....I.......OMG I ADORE THIS SONG!<br><br>A song about Jack Sparrow instantly wins in my book but despite that, Michael Bolton delivers a great hook it's just brilliant.<br>(Side-note: Michael Bolton as Erin Brokovich actually....kinda suits him? )<br><br>I'm with bluezombie, I wanna hear a full Michael Bolton version. Michael Bolton is on the money when he says "NOW BACK TO THE GOOD PART!" This is pretty cool and it's the best by The Lonely Island by far but it wouldn't be this high without Bolton. Just brilliant. Well the Michael Bolton parts anyway. The lame club contribution of The Lonely Island robs it of 2 stars. I demand a Michael Bolton only version. It would be cool if MB can return to the Aussie charts with this song though. Bin kein großer Freund dieser Kombo. Pretty funny and the chorus/the other Michael Bolton parts are great. It's facepalm material without being facepalm material. I don't really like either of them in this. Not for me, in other words. Finally, a decent tune from them. Find`s auch geil. :-) Der Sound ist echt sauber produziert und der Verarsche-Song kommt echt funny rüber.<br><br>5* kann ich dafür verschenken. ▒ Grappige plaat, met een komische HD-videoclip uit mei 2011 van "The Lonely Island" & "Michael Bolton" !!! Ruim 4 sterren voor "Jack Sparrow" ☺!!! Peaked at #64 in Australia, 2011.<br><br>Peaked at #25 on my personal chart.<br><br>Came in at #147 on my TOP 200 OF 2011. I never understood how this could be so successful in Sweden. It's not that good? Michael Bolton's Stimme ist einfach der Knaller. Er reisst den Song richtig raus. Sehr gut. I enjoy the two completely different songs they've got going on here as well. Tolerable and probably their best.